Again, not our moving day. We’re in corporate housing in downtown Chicago, high up on the 48th floor. You can see the view in the photo of Charlotte. We can just about see the fireworks each Wednesday and Saturday night. After an afternoon at the pool, we come upstairs and play UNO. I look out at the lake, pretend it’s the ocean and decide we’re at a seaside resort. We’ve moved. Children’s Hospital has moved. Now it’s time for Charlotte’s Journey Home to move. I’ve decided to move to WordPress so that when I write I only have to use one platform (my other blog, Culture Bean, originated here. Like that blatant plug?). I’m working on importing the past seven years to WordPress so you don’t have to toggle back and forth. In the meantime, please note that Charlotte’s Corner (upper right nav) has it’s own tab and will be updated as the muse takes her. We’ve had quite an adventure over that past week or so. For the third time in about 18 months, we watched movers pack up our household and load it onto a truck. This time, instead of moving closer to Charlotte’s school (as we did last summer), we are again relocating. We’ve moved back to Chicago, lured by a career opportunity that Philippe simply couldn’t pass up. Charlotte spent last week in tennis camp while the movers packed and loaded the truck. Each day, she came home and was a bit disappointed by the progress that had been made. First, she felt a bit discomfited because so much of her room had been packed up. She told me that she would feel uncomfortable not seeing her art table and stuffed animals if she woke up in the middle of the night, that seeing her things comforted her and helped her go back to sleep. Just like her daddy, Charlotte “likes her furniture.” Since Philippe was in New York that night, I had her sleep with me. The next day she was simply bored because all her toys were packed up. I think she was actually tired from 7 hours of tennis camp, to tell you the truth. Since her piano wasn’t yet wrapped, I suggested she play, which she happily did until dinner time. After dinner, she collapsed into bed. Wednesday night I distracted her with an outing to her favorite restaurant, Stone Hearth Pizza, followed by a trip to Rancatore’s Ice Cream. By the time we got home, she was too tired to realize that the house was half-empty. Phil’s Knightrider: The Volvo is the last item loaded onto the truck. Charlotte on a lobby couch at the Hotel Marlowe. Kid was TIRED. 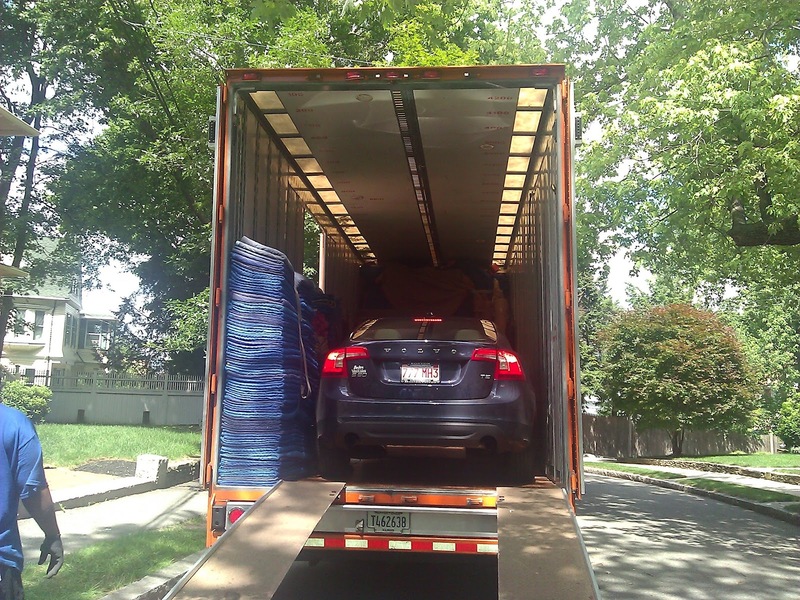 By Thursday night, all of our belongings were on the truck, including the car. We packed up a rental SUV and all of us (me, Philippe, Charlotte and the kitties) spent the night at the Hotel Marlowe in Cambridge. While Charlotte had her last morning at tennis camp, we got the house cleaned, Philippe spackled the walls where we’d hung things, and we walked through with our landlady. Then we hit the road. We split the trip into three five-ish hour legs to assure that the cats wouldn’t be in their boxes too long and Charlotte wouldn’t get too antsy. We needn’t have worried about Charlotte: As long as she had the iPad and could eat McDonald’s or ice cream when we stopped, she was just peachy. I think she watched Bolt three times. She did some word searches and read a few chapters of Dragons of Blueland. Yesterday, I’m pretty sure she played My Horse (thanks, Bamma) all the way from Cleveland to Chicago. The cats also did better than last time, perhaps because we were all together and each day was a bit shorter than Phil’s last cross-country trek with them. 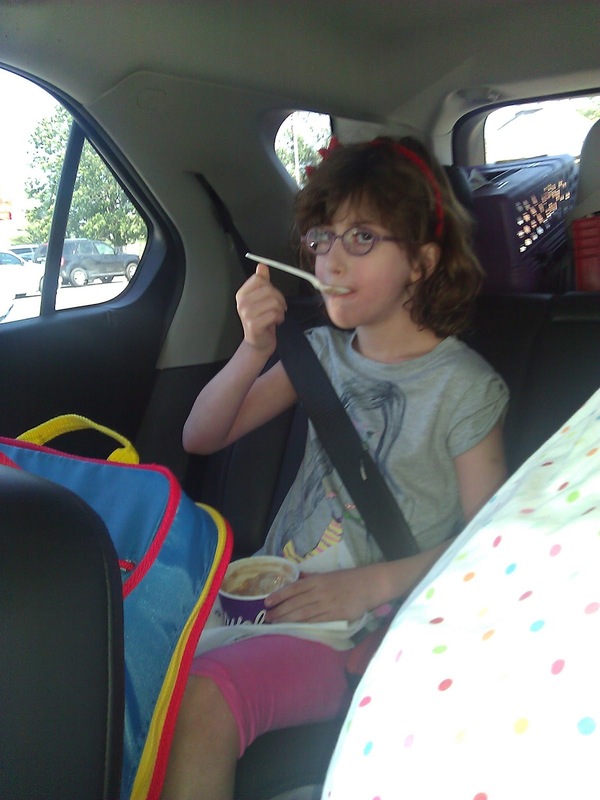 Road trip ice cream en route from Syracuse to Cleveland. Philippe booked hotels that were cat-friendly and had pools. 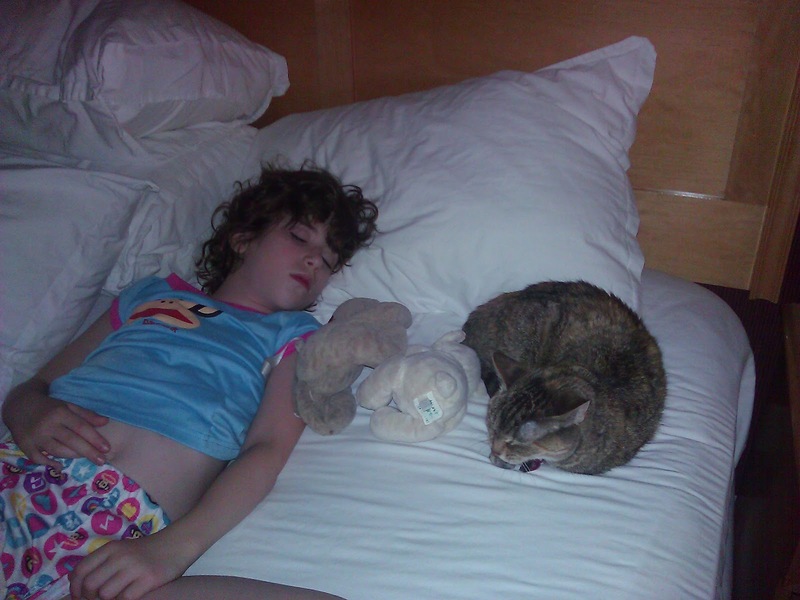 By the time we go to Cleveland, Charlotte was too tired to go the pool! She was eager enough to arrive in Chicago that she was happy to skip the pool yesterday morning. Or, maybe she just wanted to get back to the iPad. Charlotte has been amazing through all of this–from the day we told her we were moving through this very moment. She’s got decidedly mixed feelings about this move. She has made some wonderful friends in Boston, real friends with whom she shares secrets, makes up games, and has inside jokes. She’ll miss them. And she’s afraid they won’t remember her or answer letters. Charlotte and Esther Williams in Cleveland. On the other hand, she knows she is returning to a school she remembers (sort of). Walking through the Lycée Français de Chicago building a few weeks ago, she was heartened that some of her old friends waved at her and her teachers greeted her with nothing short of glee. She’ll return to the awesome Fred’s Camp next week where she’ll spend the summer with a couple of classmates from the Lycée; we’re hoping that will ease her transition. Right now she is as tired as I’ve ever seen her. It’s 9:15 a.m. in Chicago, 10:15 EST (the time zone her body is used to), and she is still asleep. Since our apartment has eastern views, she’s had the sun in her room since 5 a.m., but that hasn’t made a difference. When she gets up, we’ll go to the pool (we love corporate housing for summer) and probably walk by “Charlotte’s Hospital.” You see, the one thing she knows for sure, the one question she didn’t ask this time that she asked last time was “What hospital will I go to? And who will my doctors be?” She knows that Chicago is the land of “Charlotte’s Hospital” and her doctors await her. We’re not quite “home” yet as we need to find a house. But we’re here, safe and sound, in Chicago, the place Charlotte was clearly meant to be.